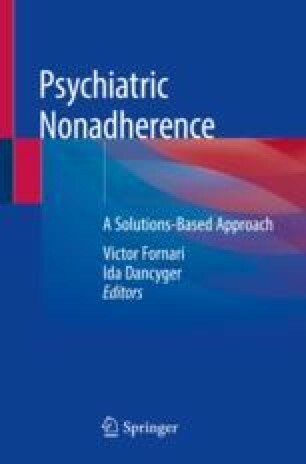 This chapter reviews technological approaches to psychiatric nonadherence. Broadly, clinicians have long been engaged in technological approaches to improve patients’ adherence to optimal treatment plans. Nonadherence can be related to the complexity of our health systems and associated difficulties with appropriately accessing or utilizing care. Technologies that have found ways to better connect patients to their clinicians have had the most success. Patients are generally more adherent when they better understand their condition, and accessible psychoeducation materials and platforms that extend patients’ learning process beyond the clinical appointment can be valuable. Similarly, mobile health applications that extend psychoeducation provide medication reminders, and even prompt specific therapeutic interventions can improve adherence. Innovations in the physical processes in which patients receive and take their medication, utilizing devices like medication adherence monitoring systems, can increase the likelihood that patients actually take the medication they need to take. Ultimately, strategies that combine these approaches into multimodal systems in which patients are engaged and understand their mental health conditions, are supported to take full advantage of the treatment available to them, and bridge the divide between the private challenges of mental health treatment and the clinical partnership between patient and provider have the best chance of being successful. Sabate E. Adherence to long-term therapies: evidence for action [Internet]. World Health Organization; 2003 [cited 2018 Jul 4]. Available from: http://www.who.int/chp/knowledge/publications/adherence_report/en/. Morris R. The history of pill boxes [Internet]. The Hunt Magazine. 2017 [cited 2018 Dec 4]. Available from: http://www.thehuntmagazine.com/arts-antiques/2017/12/pill-boxes/.